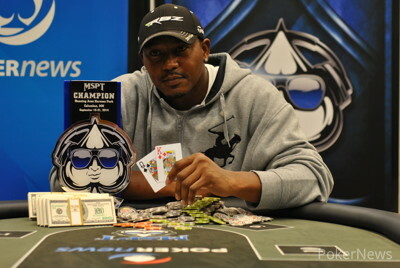 Ken Pates defeated a field of 338 players to claim an $87,698 first-place prize at the Mid-States Poker Tour's second visit to Running Aces Harness Park in Columbus, Minn. 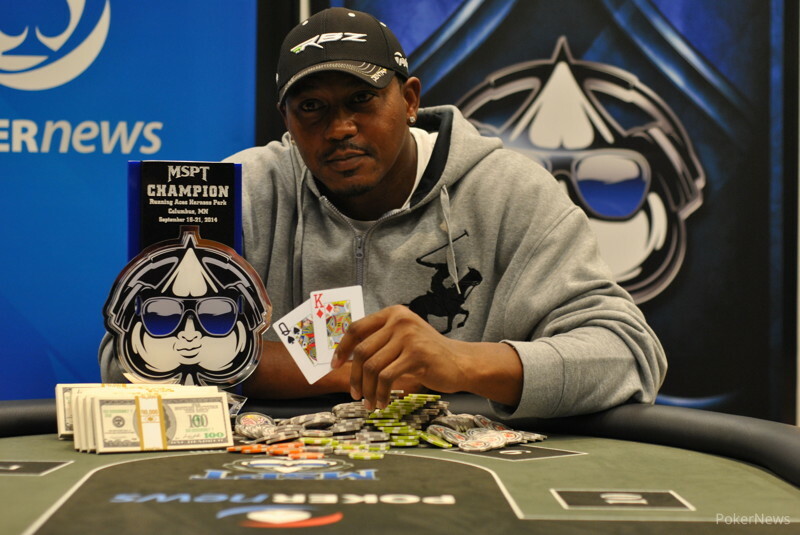 It was Pates' second visit to an MSPT final table this year after the Minnesotan took fifth at Canterbury Park in April. Day 2 of the tournament began at 10:30 a.m., and notables Matt Kirby, Jonathan Olson, Minnesota business magnate and high roller John Morgan, Marc "Poker Joker" Powers, Jeff Bryan, and Larry Ormson fell before the money. The early levels also saw eventual heads-up combatants Pates and Dennis Stevermer chip up considerably and take the top two spots in the counts. Pates had already built a top-five stack when Pates and Josh Dahlstrom got it all in on a flop of , with Pates at risk for more than 200,000 in a monster pot. Pates had flopped a set with , while Dahlstrom had elected to roll with his . No help came on the last two streets for Dahlstrom, and Pates took the chip lead. After the elimination of John Wilhelmy on the bubble, Tony Hartmann, MSPT Canterbury champion Mike Wilmes, start of Day 2 leader Andrew Null, John "JohnnyGstaks" Hayes, and Mark Sandness, who won this tournament in February, collected payouts before heading out the doors. The end came in brutal fashion for Sandness when he jammed all in with on a board and was called by Steve Vang's . Vang binked the on the river for two pair. Former MSPT champions Jason Seitz, Jeremy Dresch, and Ben Marsh headlined the final 10, but Seitz and Dresch were dispatched in eighth and ninth, respectively, following the elimination of Bill Perpich in 10th. William Vincent went out in seventh, and 90 minutes of six-handed play led to Marsh exiting after a failed limp-shove with in a blind battle against the unimproved of Ervin Bjerga. Dan Shogren followed in fifth when his was outdrawn all in preflop by the of Stevermer, who hit trips. Next out the door was short stack Steve Vang in fourth after Bjerga called his shove with and hit a pair of jacks on a board to beat . Bjerga's willingness to gamble preflop finally caught up to him though, when he lost nearly all of his stack calling the 40-big blind shove of Pates, whose queens held against pocket sevens. A crippled Bjerga busted shortly after in third. Pates and Stevermer played a short and very aggressive heads-up match that ended when the board read and Stevermer bet 200,000. Pates raised to 600,000, and Stevermer pushed all in. Pates made the call. "I'm on a draw," Stevermer announced as he got out of his seat, throwing down for a gutshot and a flush draw. "Good call." Pates flipped for top pair. The two awaited the river card, and the dealer placed the on the felt, pairing the board and keeping Pates' kings best. The tournament director counted down stacks, and Pates had his opponent covered by about 100,000. He embraced the small crowd that had gathered on the rail for him before shaking Stevermer's hand and accepting his congratulations. On fourth street, the board read when Dennis Stevermer bet 200,000. Ken Pates raised to 600,000, and Stevermer pushed all in. Pates made the call. Ken Pates three-bet to 325,000 after a 125,000 open from Dennis Stevermer, who called the reraise. Pates bet 500,000 on the flop, and Stevermer let it go. 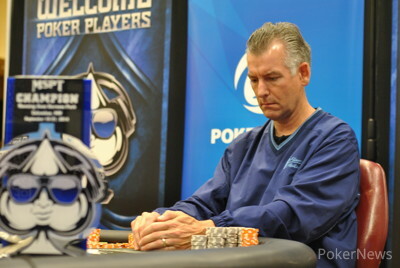 On the first hand of heads up, Ken Pates raised to 140,000, and Dennis Stevermer made it 350,000. Pates called, and he called a continuation-bet of 500,000 on the flop. Both players checked the , and Stevermer snap-shoved on the river. Pates folded, and stacks are now about equal. 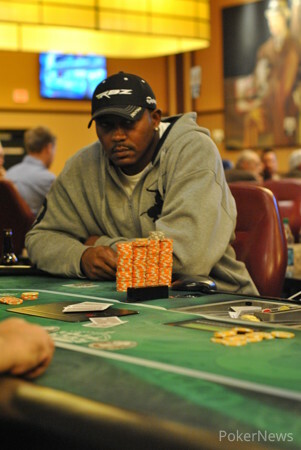 Ervin Bjerga bumped it up to 90,000 on the button, and Ken Pates made it 290,000 in the big blind. Bjerga announced all in and was snap-called. Bjerga had made his stand with suited connectors but was miles behind the cowboys of Pates. A helped Bjerga a bit with a gutshot, but a turn closed off backdoor possibilities by giving Pates a set. The river brought the , and the tournament is now heads up. 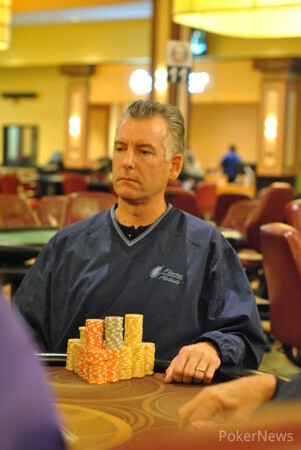 Ervin Bjerga doubled up twice all in preflop and then shoved over a 160,000 raise from Ken Pates, forcing him to fold. A raising war took place between Ken Pates and Ervin Bjerga after the elimination of Steve Vang. Pates made it 300,000 to go, Bjerga raised to 700,000, and Pates shoved all in. Bjerga called. Pates pumped his fist as the dealer spread a flop of , giving him a set. The turn meant Bjerga was drawing dead. 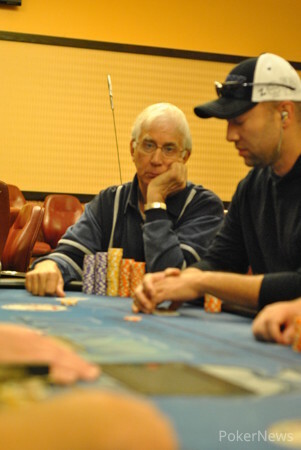 Dennis Stevermer and Ken Pates play heads up.